It is good to snack between meals, to instil a bit more energy into your tired self and put you back on track! Junk foods are absolutely blacklisted during a typhoid attack. So, don’t think twice before putting away the pizzas, pastas, mithais, aerated drinks, cakes and chocolates, which not only load your digestive system but also inhibit your immune system! Replace these with healthy snacks like the Fruit Chaat, Quick Rice Panki, or Moong Dal Dosa. 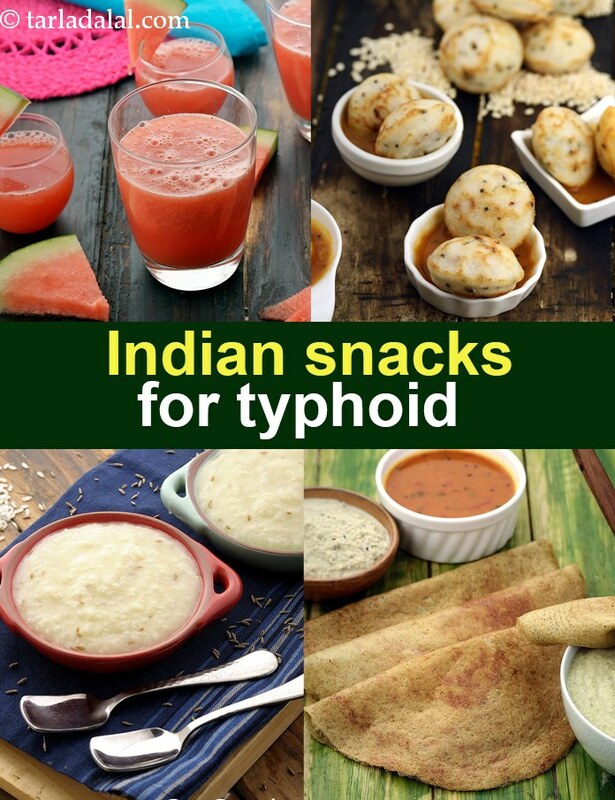 These will ensure you get enough protein and vitamins – much needed nutrients for your body to recover from typhoid. For some very light snack options, you can try Date and Walnut Balls, Apple Stew, etc., or a drink like the Watermelon and Coconut Water Drink. Snacks that are made of eggs, milk and milk products must be chosen selectively, based on individual tolerance to these ingredients. Suggested serving size for 100 calories: 1 serving the low-cal, nutritive fruit chaat is an all-time favourite, anytime snack. The tangy and sweet orange-mint dressing lends it a dash of exotica.